For the proposed language family, see Indo-Pacific languages. 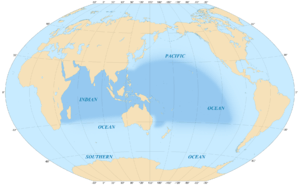 The Indo-Pacific, sometimes known as the Indo-West Pacific, is a biogeographic region of the Earth's seas, comprising the tropical waters of the Indian Ocean, the western and central Pacific Ocean, and the seas connecting the two in the general area of Indonesia. It does not include the temperate and polar regions of the Indian and Pacific oceans, and the Tropical Eastern Pacific, along the Pacific coast of the Americas, is also a distinct marine realm. The term is especially useful in marine biology, ichthyology, and similar fields, since many marine habitats are continuously connected from Madagascar to Japan and Oceania, and a number of species occur over that range, but are not found in the Atlantic Ocean. The region has an exceptionally high species richness, including 3000 species of fish, compared with around 1200 in the next richest marine region, the Western Atlantic, and around 500 species of reef building corals, compared with about 50 species in the Western Atlantic. The WWF and Nature Conservancy divide the Indo-Pacific into three realms (or subrealms), and each of these into a number of marine provinces. The Western Indo-Pacific covers the western and central portion of the Indian Ocean, including Africa's east coast, the Red Sea, Gulf of Aden, Persian Gulf, Arabian Sea, Bay of Bengal, and Andaman Sea, as well as the coastal waters surrounding Madagascar, the Seychelles, Comoros, Mascarene Islands, Maldives, and Chagos Archipelago. The Central Indo-Pacific includes the numerous seas and straits connecting the Indian and Pacific oceans, including the seas surrounding the Indonesian archipelago (with the exception of Sumatra's northwest coast, which is part of the Western Indo-Pacific), the South China Sea, the Philippine Sea, the north coast of Australia, and the seas surrounding New Guinea, western and central Micronesia, New Caledonia, the Solomon Islands, Vanuatu, Fiji, and Tonga. The Central Indo-Pacific, due in part to its central location at the meeting of two oceans, has the greatest diversity of corals and mangroves. The Eastern Indo-Pacific surrounds the mostly volcanic islands of the central Pacific Ocean, extending from the Marshall Islands through central and southeastern Polynesia to Easter Island and Hawaii. Since 2011, the term ‘Indo-Pacific’ is being used increasingly in the global strategic/ geo-political discourse. The term was first used in an article authored by Gurpreet Khurana, which was carried in the January 2007 issue of the Strategic Analysis journal (Routledge/ IDSA) titled "Security of Sea Lines: Prospects for India-Japan Cooperation". In the article, the term ‘Indo-Pacific’ refers to the maritime space stretching from the littorals of East Africa and West Asia, across the Indian Ocean and western Pacific Ocean, to the littorals of East Asia. The spirit of the term was picked up by Japan’s Prime Minister Shinzo Abe, as reflected in his speech to the Indian Parliament in August 2007 that talked about the "Confluence of the Indian and Pacific Oceans" as "the dynamic coupling as seas of freedom and of prosperity" in the "broader Asia". From 2010 onwards, the term Indo-Pacific acquired salience within the Indian government and has since been used often by India's apex political leadership. From about 2011 onwards, the term has been used frequently by strategic analysts and high-level government/ military leadership in Australia, Japan and the US to denote the said region. However, a formal/ official documented articulation of the term first appeared in Australia’s Defence White Paper, 2013. It has been argued that the concept of the Indo-Pacific may lead to a change in popular "mental maps" of how the world is understood in strategic terms.Lately, the US officials have begun using the term "Indo-Asia Pacific".This would enable America to maintain its geographic inclusiveness in the new coinage of 'Indo-Pacific'. ↑ David Brewster. "Dividing Lines: Evolving Mental Maps of the Bay of Bengal. Retrieved 21 September 2014" Check |url= value (help).